Medina, Meg. Merci Suarez Changes Gears. Fiction. Candlewick, 09/2018. 368pp. $16.99. 978-0-7636-9049-6. OUTSTANDING. GRADES 4-6. 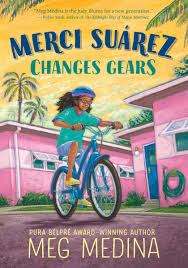 As a scholarship student at Seaward Pines Academy, navigating middle school is particularly tricky for 11-year-old Merci Su­arez. Merci’s assignment to welcome and orient Michael Clark, the new boy at school, puts her in the path of mean girl Edna Santos, who has a crush on Michael. Merci’s home life, dis­rupted by her beloved grandfather’s struggle with Alzheimer’s disease as well as her mother’s insistence that she babysit her 5-year-old twin nephews and focus on other household con­cerns, renders her unable to participate in after school activities like soccer. She is embarrassed to have classmates come to her house, where she lives next door to her extended family in three pink Florida homes they call Las Casitas. However, Merci is strong and resilient in the face of adversity, including under­handed sabotage by Edna and even a car accident. She ultimate­ly learns to accept and understand events in her life with com­passion and humor, drawing greater meaning and hope from the love of her family despite the ups and downs of middle school. Pura Belpré award-winning author Meg Medina has written a beautiful book.